If you’re looking for a quick and easy way to preserve vegetables at home, then you should consider freezing them. By freezing food at the height of ripeness you can preserve freshness, flavor, vitamins and minerals. Also, being able to eat fresh produce year-round, leads to a healthier and more well-balanced diet. Freezing your own vegetables has a lot more benefits that using store-bought frozen vegetables. This is because there are a lot of additives and a large amount of salt and sugar that is used on store-bought frozen foods. Freezing them yourself puts you in the driver’s seat. Vegetables must be frozen at the height of their ripeness. This is because they continue to undergo chemical changes that can cause spoilage and deterioration the longer they are kept. So, in order to prevent the loss of nutrients and color and flavor changes that will occur, enzymes in the fruits and vegetables must be inactivated. This can be done by the blanching process. This process involves the exposure of the vegetables to boiling water or steam for a brief period of time. After that, the vegetable must be cooled rapidly in ice water. 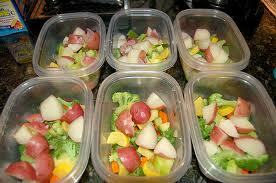 Blanching is very necessary in order to produce top-quality frozen vegetables. It also helps to retard loss of vitamins, makes some vegetables more compact, retains colour and helps to destroy microorganisms on the surface of the vegetable. The problem of rancid oxidative flavours that may have developed can be prevented by using a wrapping material that does not permit air to pass into the product and by removing as much air as possible from the freezer bag or container before freezing. Textural changes can be prevented by setting the temperature of the freezer at the coldest setting. Several hours before the food is placed in the freezer. Freezer burn can occur as a result of moisture loss. This is very likely to develop flavours that may be “off”. To prevent this, stick to packaging that is heavy-weight and moisture-proof. Do not keep freezer doors open, since they can accidentally thaw products and lead to microbial growth in the freezer. Most vegetables can stay high quality from 12 to 18 months at a time at 0°F or lower. Freezing is a safe and healthy option to keep your vegetables fresh and nutritious for long periods of time, and is fast becoming the favorite method of food preservation for people around the world.